Designed and manufactured in Italy, Solidea compression stockings are a trusted and medically certified brand sold in over 70 countries worldwide. Compression can be used to treat various conditions caused by poor circulation, such as varicose veins, oedema, and venous disorders. They are also excellent for preventing the uncomfortable swelling of the legs and feet that results from sedentary lifestyles or being on your feet all day. Compression works by constricting superficial veins in the legs, causing them to push your blood around more effectively so that it can reach everywhere it needs to and keep you healthy and comfortable. Solidea compression socks are specially designed to ensure that the correct amount of pressure is exerted on the right parts of your feet and legs to ensure optimum circulation.With a medium graduated compression of 25/32 mmHg, they are suitable for treating conditions such as deep vein thrombosis, lipoedema and angiodysplasia. The socks come in a low-key, opaque black that will go with any outfit. Anti-stress soles cushion and massage your feet all day long for exquisite comfort. A specially designed band at the top will ensure that your knee-highs stay in place without leaving annoying marks. Abrasion tests carried out by Solidea on their socks showed that they had a very good level of resistance to wear and tear, even on the ankle and heel! Solidea’s soft and comfortable knitted fabric features Lycra for extra stretch and has been given Oeko-Tek Standard 100 certification – this means that it has been independently shown to contain no harmful chemicals (including carcinogens, allergens and irritants). These compression stockings use Sanitize Actifresh technology, which acts like a built-in deodorant to prevent unpleasant odours from forming. Its moisture-resistant properties protect the fabric from the bacteria, mildew and damage that can occur when socks get sweaty, keeping your feet fresh and clean. They can be either machine or hand washed. 8/15mmHg: Very light compression for general relief of tired, aching legs. 15/20mmHg: Mild compression for long periods of inactivity like traveling (lowered blood circulation), or times where the body is under stress such as during exercise or pregnancy (pressurised swelling). 20/30mmHg: Relief for moderate to severe venous disorders, often prescribed to prevent ulcers, clotting and worsening of skin bulging. 30/40mmHg: Relief from severe or chronic venous disorders and swelling, particularly following an episode of DVT or during convalescent periods (such as surgery in the affected area). Standard vs Plus sizes: Many conditions that require compression stockings cause the legs to swell up to the extent that a larger leg circumference is needed - Solidea cater for this with their Plus range. 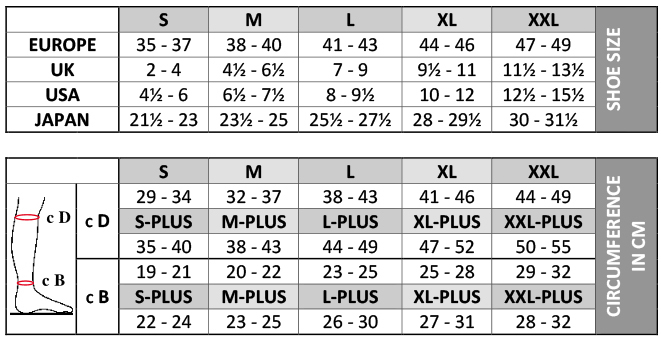 The difference in sizes is detailed below. Healthy circulation, to combat varicose veins and venous diseases. Also prevent swelling from sedentary lifestyles and travel. Machine wash at 40 or hand wash in warm water. Do not tumble dry, dry clean or iron.